Hi runners! 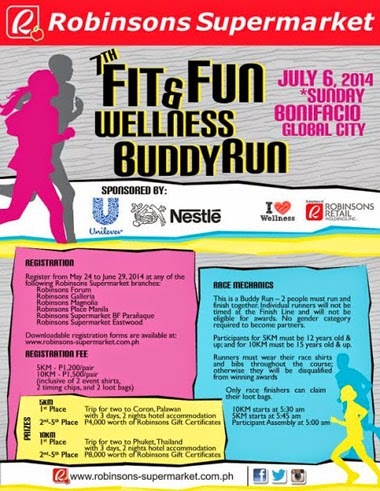 Go and run with your running mate and join the Robinson's 7th Fit & Run Wellness Buddy Run on July 6, 2014 Sunday at Bonifacio Global City, the event is where the two (2) participants must run and finish together. Participants for 5KM must be 12 yr.old & up while the 10KM must be 15 yr.old & up. Be the top finisher with your buddy/partner and win a trip for two(2) in Coron, Palawan (for 5KM) or Phuket, Thailand (for 10KM), plus the 2nd placers to 5th placers will receive a corresponding cash prizes. You can download registration forms from www.robinsons-supermarket.com.ph. Register now and see you at the race! Good News Manileños! This your chance to accept the challenge to run like you've never run before. 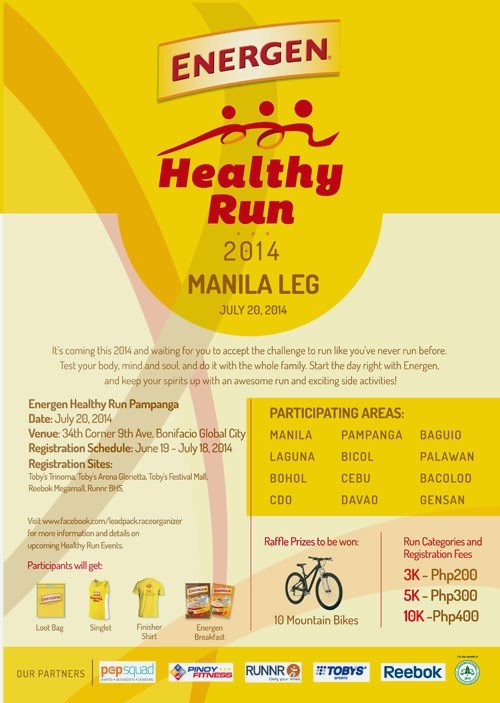 Join the Energen Healthy Run 2014 The Manila Leg on July 20, 2014 at 34th Corner 9th Ave., Bonifacio Global City. Test your body, mind and soul and do it with the whole family. Registration is now open until July 18, 2014. Register now at all participating venues listed below! *Participants will get loot bag, Singlet, Energen breakfast and Finisher’s shirt (for 10K participants). Plus, get a chance to win a Mountain Bike on event raffle draw. Hi jobseekers! Want a career abroad? or just here around the Metro? Come and join The Philippine STAR Career Guide Job Fair on June 24-25, 2014 from 10am to 5pm at Megatrade Hall 1, SM Megamall. There are lot of job openings await qualified applicants for overseas and local hiring. You can have a pre-register online, please visit http://workabroad.ph/jobfair1 and fill out the forms. Register now and see you there! Visit careerguide.ph Facebook page for more details and latest updates. The Lumineers are an American Folk-Rock band, based in Denver, Colorado that popularized the hit songs - Ho Hey, Stubborn Love and Slow it Down will visit here in our country. 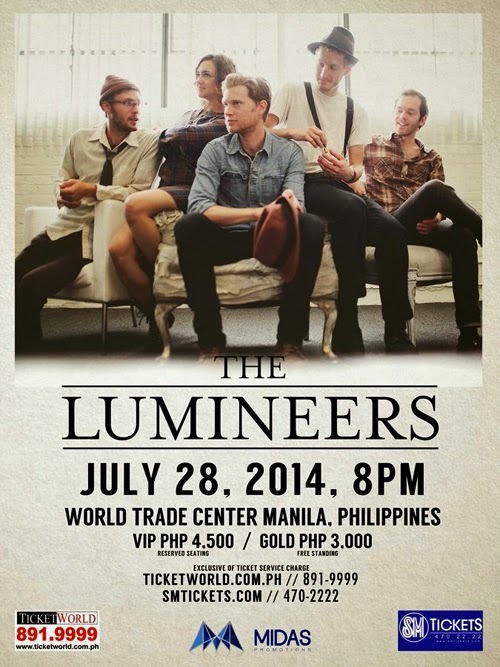 Midas Promotions brings The Lumineers Live in Manila on July 28, 2014, 8PM at World Trade Center Manila, Pasay City. Tickets are available at Ticketworld and SM Tickets outlets and online. Go and get your tickets now! Hi there Manileños! Get ready and run for the Manila Bay Clean-up Run 2014 on July 13, 2014 at Cultural Center of the Philippines (CCP) Complex Ground, Pasay City. The event is organized by Manila Broadcasting Company (MBC) in partnership with the National Collegiate Athletic Association, for the benefit and a campaign of a clean up drive for Manila Bay. 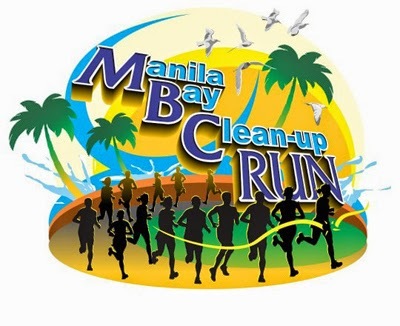 Manila Bay Clean-up Run will feature 3K, 5K, 10K, and 21K distance run. Register now and let's help clean-up Manila Bay. For details contact 482-5143 or 0926-2052787. 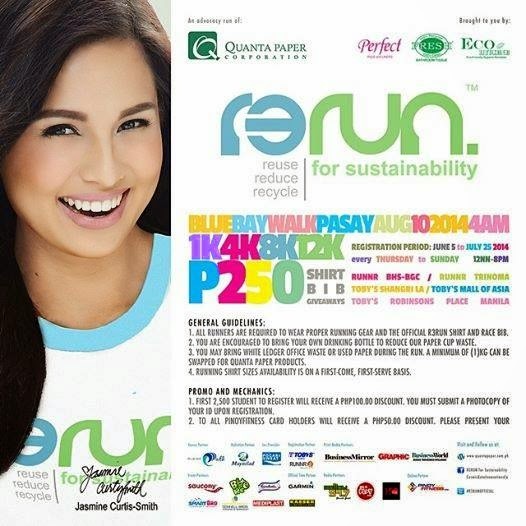 Come and join the run at the R3RUN for Sustainability Fun Run on August 10, 2014 at Blue Bay Walk, EDSA-Macapagal Ave., Pasay City. The event is aims to educate consumers on the importance of green-labeled products and how patronizing them could help in a way to protect our planet. Register at the following RNNR and Toby's outlets: Trinoma, BHS-BGC, Shangri La Mall, Mall of Asia and Robinsons Place Ermita. Registration starts on June 5, Thursday to Sunday, from 12nn to 8pm. Register Now! Organized by: Cosmic Gate Innovations, Inc.
Visit www.cheapanggangdiva.wordpress.com for full details and R3RUN for Sustainability for the latest updates.